What is the ideal costume for a kid who loves both Christmas and choir practice? Yes, Karaoke Santa would surely be a hit, but that is not actually the look we were referring to. 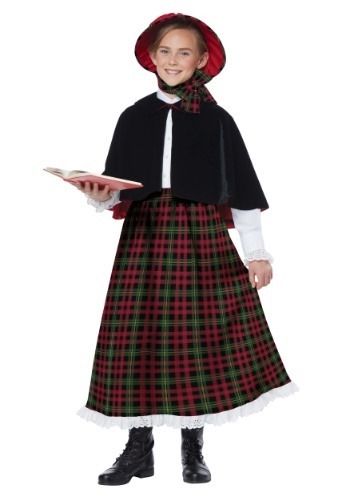 We were talking about a classic caroler costume, like this one, to spread holiday cheer and charming music wherever your little songstress goes. Because really, whether she wears this winsome look for Halloween, a school play, or a real round of Christmas caroling, she will be instantly filled with the magic and joy of the greatest season of the year. Not to mention, this costume will pair perfectly with a mug of hot cocoa and some time spent warming up her pipes in front of the fire. Festive, historic, lovely, and timeless, this Girl's Holiday Caroler Costume will help her have a holly, jolly Christmas, any time of the year! This is a costume that will take your child back—way back—to simpler times, when lamps were lit by oil and Christmas gifts were not electronic! It comprises a tartan plaid skirt in Christmas hues of red and green, with an eyelet ruffle detail. It has a cute black velvet capelet, and the bonnet fastenss under her chin with plaid ribbon that matches the skirt. Add gloves, or just keep the cocoa coming to keep her fingers toasty as she turns the pages of her song book amidst the falling snowflakes. The magic of the holiday season is the cozy cheer it manages to impart. Now your child can be a part of that magic—and practice her range—in this classic costume. Grab a few of our adult and boy's version of this same costume, and prepare to turn your family into a brilliant band of caroling merry-makers!